Since going gluten free I have been longing for some waffles and recently found a new gluten free recipe by Brittany Angell that I wanted to try, so this was my chance. Let me just say these waffles were AMAZING. I was in heaven! You wouldn’t know they were gluten free unless someone told you. This recipe is a part of a 21 Day Sugar Detox program, so I added in some vanilla extract and honey to sweeten it a little bit. Check it out. 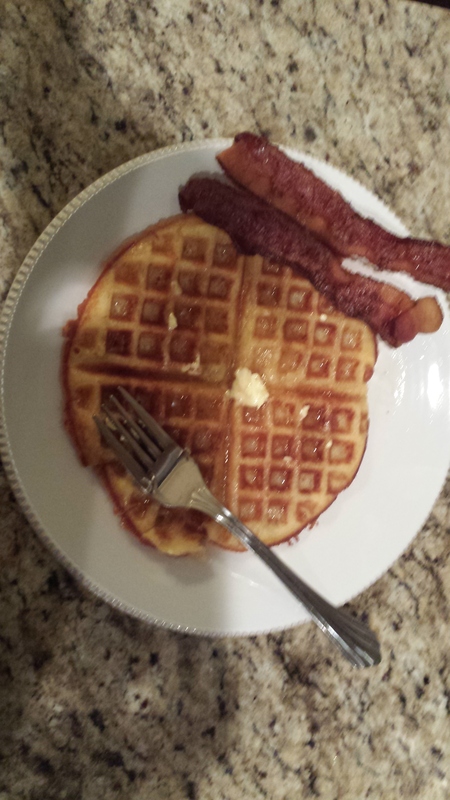 Preheat a round waffle iron to a medium setting if there is the option. In a large mixing bowl combine the almond flour, arrowroot starch, baking powder and salt until well combined. Add in the remaining ingredients and stir until well combined. Liberally oil the preheated waffle iron and pour approximately 1/3 cup worth of the waffle batter onto the center of the iron. Close and allow to cook for 2-3 minutes or until desired doneness. Repeat with remaining batter. Makes about 5 round, thin waffles. So back to the bacon. I put it in the oven first before starting the waffles. That’s right, I said oven. I know alot of people fry their bacon in a pan, but after seeing Diane Sanfilippo’s recipe for baking it, I’ll never go back. Simply cover your baking sheet with foil, lay the strips of bacon on top of the foil and cook in the oven for 20-30 minutes on 350. When the bacon is finished, I lay the strips on top of a paper towel to soak up some of the fat. Then, I pour the fat that is left on the baking sheet into a mason jar to save it for cooking other things, like roasted brussel sprouts. I know most folks think bacon is bad for you, but check out Diane Sanfilippo’s blog on bacon. It might change your mind.